Reader Chris P. alerted us to a fascinating post from Errol Morris' blog, which presents results in graphical form from a readers' poll related to this other post. This other post deals with a pair of photographs taken during wartime, previously discussed by Susan Sontag and others. Sontag believed the pair documented a before-and-after setting: it was alleged that the photojournalist shifted some cannon balls from their natural position between takes. Morris polled his readers asking them in which order they thought the photos were taken ("on before off", "off before on", "undecided"), and which factors were used to make the decision. He presented results in two formats, first plotting frequencies in bar charts and then plotting proportions in pie charts. He preferred the pie chart construct. Most here would share Chris' reaction: "Oh my. What people do with Excel." 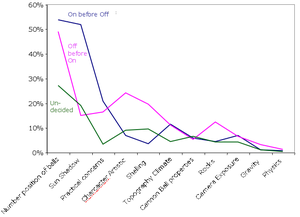 30% of the decision factors submitted by respondents who decided "on before off" were "sun shadow"
It is tough to figure out what the second statement means. It is as if the respondent who selects more than one factors gets more than one votes in the final tally. To put it differently, the 30% is meaningless unless one also knows how many decision factors were selected by each respondent, on average and in distribution. The 52% is independent of such consideration. 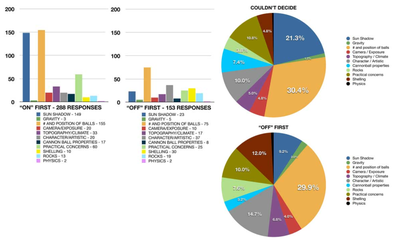 Combining the data given in the bar charts and pie charts, one discovered that 469 out of 910 respondents could not decide which photo was taken before the other; besides, these respondents on average expressed 0.9 opinions on the decision factors whereas the respondents who made a decision expressed 1.6 opinions. A simple illustration to show the key decision variables by type of respondents is shown below. From this chart, one sees that the number and position of the cannon balls were crucial to at least 50% of those who came to a conclusion. Sun shadow were much more important to those who decided "on before off" while those who decided "off before on" noticed character artistic, shelling and rocks. Most other factors did not differentiate the three groups. Source: "Not Your Mum's Apple Pie Chart", Errol Morris, Dec 18, 2007. In the previous post, we discussed how charts need to address the key question posed by the data. In this case, the journalist was trying to show that police shots often go errant, and are largely unpredictable even when the distance of the target is given. In the comments, there is interest in seeing the hit rate v. distance chart. Because the data came to us in buckets, we do not have enough to continue the analysis. If one were to guess, the real curve would start out with 100% accuracy at distance 0, fall sharply to a plateau in the 20-40% range at modest distances, and then drop again at large distances, decaying to zero. The left chart is our hit rate chart above, except the golf data set is larger, allowing a curve fitting. The right chart is the fitted curve which is a "model" for the true relationship between accuracy and distance from the hole. The model fitted the data well. Gelman and Nolan didn't just find any best fitting line through the data. They started out with a trigonometric model (shown on the right), with the angle of the putt as a random variable. With this setup, they wrote down the formula for computing the probability that the putt will fall in, that is, the proportion of success. The angle is assumed to follow a normal distribution with the standard deviation being an unknown parameter. The standard deviation is estimated from the available data. Of course, the human body is a bit harder to model than the hole in the ground but this procedure could very well apply. For more details, check out the paper (PDF). This example is also found in their book on teaching statistics. Source: Gelman and Nolan, "A Probability Model for Golf Putting". In this NYT article, we are told that "the most likely result when a policeman discharges a gun is that he or she will miss the target completely." That's a shocker for those of us conditioned by Hollywood movies to think anyone who picks up a gun for the first time hits the villain right on the temple. The following graphic attempts to tell the story. The one hit here is how the distances are visually presented. The elliptical lines remind us of the neglected variable of direction; it also means the scale is correct only along one direction. The dot matrix construct highlights the absolute numbers of shots, hits and misses but barely addresses the key issue of hit rates (accuracy). Specifically, this data set was presumably collected to explore the relationship between hit rates and distances from the target. The use of different widths clouds our judgement of proportions. To wit, it is not obvious that the 10-wide block and the 40-wide block shown left depict roughly equal hit rates (23%, 29%). The junkart version adopts a different approach. This is the Lorenz curve, often used to show income inequality (see also here and here). 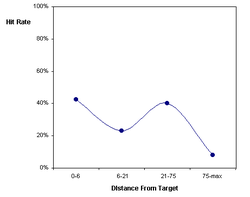 Here, the shots were ordered from closest to furthest from target, then summed up by distance segments. For example, shots from 0 to 6 feet accounted for 60% of all shots but 72% of all hits. 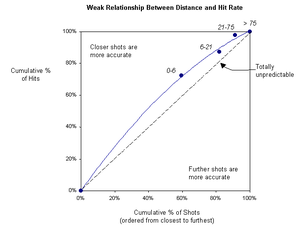 If distance does not affect hit rates, we'd expect 60% of all shots to result in 60% of all hits. This data point would show up on the 45-degree diagonal on the chart, labelled "totally unpredictable". Any data appearing above the diagonal indicates that closer shots are more accurate, accounting for more than their fair share of hits. Comparing the fitted blue line and the diagonal, one sees that distance is a weak predictor of hit rate. 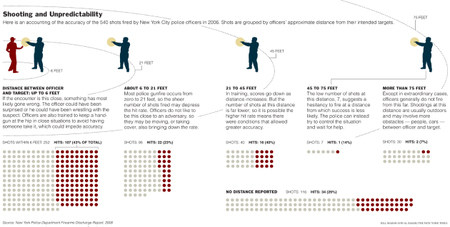 The police commissioner explains this in the article; many other variables also affect accuracy, including "the adrenaline flow, the movement of the target, the movement of the shooter, the officer, the lighting conditions, the weather..."
Note that the shots with "unknown" distances were removed from the analysis. Also, the categories of 21-45 and 45-above were combined: the rates were similar and with only three hits, it does not make sense to treat these as separate categories. Of course, this version would not work well in the mass media. For that, one can just plot hit rates against the distance categories. Source: "A Hail of Bullets, a Heap of Uncertainty", New York Times, Dec 9 2007; New York Firearms Discharge Report 2006. Nielsen, they of the ratings, is roughing it in the information age. When they announced on-line tracking tools, Wired quipped: "It's looking like online video policing companies will have to make room for another deputy." Last year, cable companies revolted over a service measuring the effectiveness of commercials. Hey! Nielsen is the place to make a name for yourself while trading opinions on TV, movies, music, personalities, web sites and more. How does one "trade" opinions? a real-time indicator of a topic's impact and value and you play a major role. As the site evolves and users submit their opinions and commentary, the score will rise or fall based on a number of factors including, but not limited to, user opinions, news coverage, and raw data from our sister sites Billboard.com, HollywoodReporter.com, and BlogPulse.com. Sounds like a product aimed at marketers to help them track public opinion but offering little control over sampling. The "Hey! Nielsen" buzz chart (below) captures the change in "Hey! Nielsen" score over time. This chart is an unfortunate case of flipping background into foreground. What grabs our attention are those hideous white circles with numbers in them. The legend explains that these are the daily numbers of opinions on the subject, in other words, the daily sample sizes. As they stand now (with the site still in beta), they serve to expose the low level of participation, leading to small sample sizes, and irrelevance. But what when the site became super-popular, would the circles say 56234, 19245, 90257, etc.? Why would visitors care about daily sample sizes anyway? Mousing over these circles reveal text but in most cases, they are blocked by neighboring white circles. In the meantime, the circles obscure the line which shows the trend in the "Hey! Nielsen" score over time. This chart reminds me of that Google toy known as Google Trends. 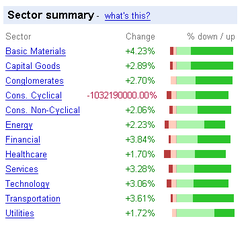 The Googlers provide no vertical scale so the graphs are unreadable. "Hey! Nielsen"ers provide a vertical scale -- kind of -- but the graphs are still meaningless: what does a score of 881 mean? how about 724? what is the maximum score? what is the minimum? Beware numbers without context. The vertical axis does start from zero but has an odd spacing of tick labels. The gridlines are distracting and serve no purpose. The orange area under the curve also makes little sense. We look forward to seeing version 2.0. Since English is my second language, I have always been intrigued by automatic translation. My "Turing" test for translation engines is to feed the translated output back into the same engine in the opposite direction. Poiché l'inglese è la mia seconda lingua, sono stato incuriosito sempre tramite la traduzione automatica. Since English is my second language, has been made curious always through the automatic translation. The tag line of this blog is "recycling chartjunk into junk art". What happens in the other direction? The answer is on this page! This entry is inspired by Michael M.
The other night, this chart popped up on my browser. If someone kept track of each time such a mishap showed up, the tally would probably be 1-5% of the time. The triple challenge of generating this graphic is the volume of data that needs to be processed, the velocity at which it changes, and the flicker of time from input to output, probably not more than a few minutes. The analysis and charting must be maintained continuously during market hours. For any such projects, the thing to manage is the error rate, and one should be totally thrilled if it's in the range Google engineers have achieved.